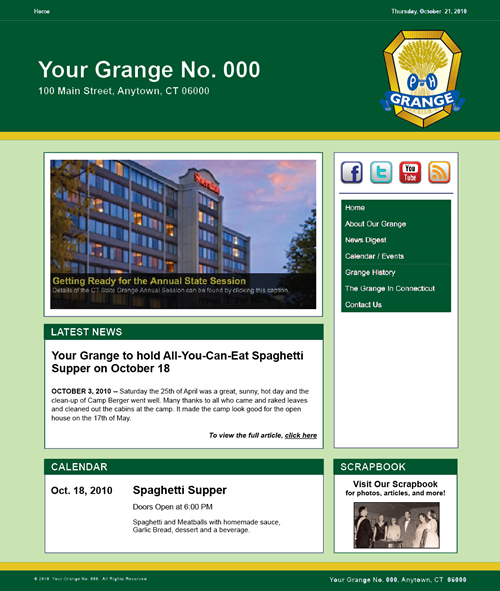 Introducing the Connecticut State Grange Website Program. Having an Internet presence provides the most efficient, cost-effective way for Granges to showcase their activities and accomplishments to their local communities and beyond. Community Granges who wish to participate in the program have TWELVE UPDATABLE DESIGNS TO CHOOSE FROM! 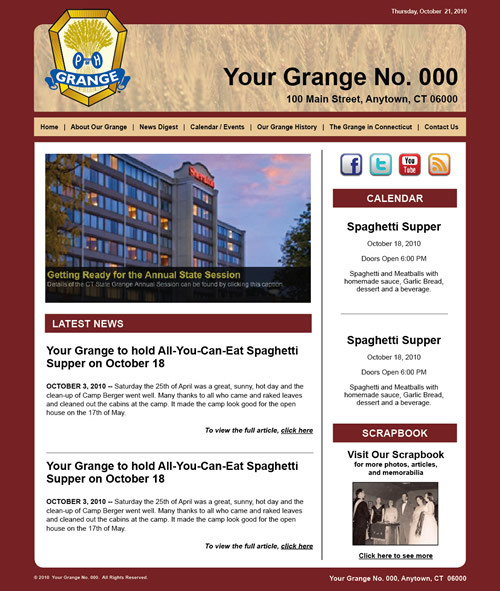 The Connecticut State Grange has created a new affordable website program for Connecticut Granges. 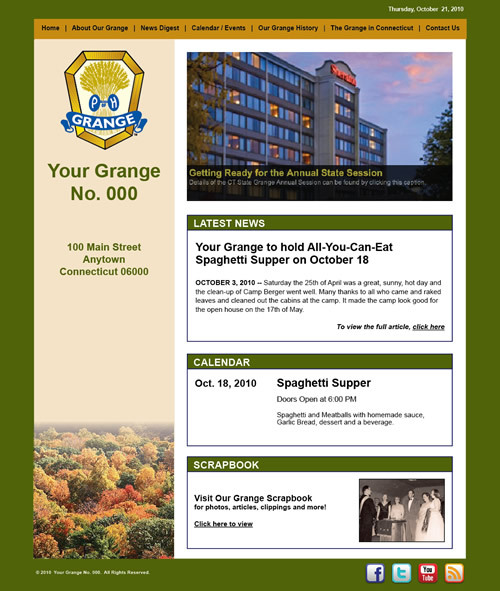 Packages include the domain name (for example, www.yourgrange.org), your choice of twelve different website design templates, website hosting and five e-mail addresses, such as info@ yourgrange.org or president@yourgrange.org. Granges will have the ability to update their own content. The website will be connected to the State Grange website, so that each individual Grange website can receive articles, calendar events, photos, etc. 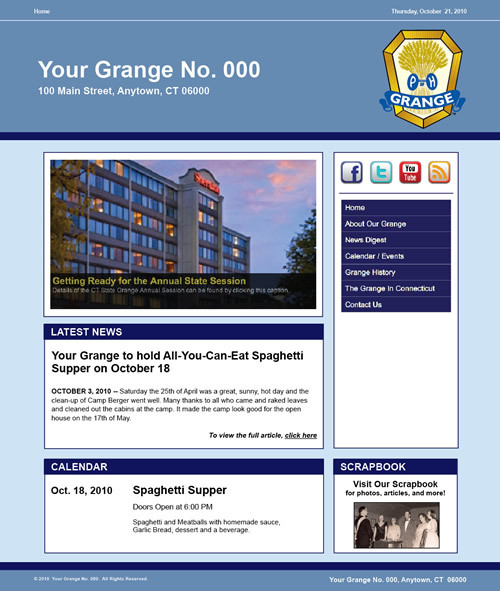 from the State Grange website, and the State Grange can receive items from the Grange websites as well. Websites will each house a number of pages that Granges can toggle on and off depending on their needs, such as a News, Calendar of Events, Scrapbook, Membership Information, Blog, Officer’s Listing and Past Masters/Lecturers Lists, Grange History, Grange Hall History, Agricultural Fair information, Social Media links, and more. 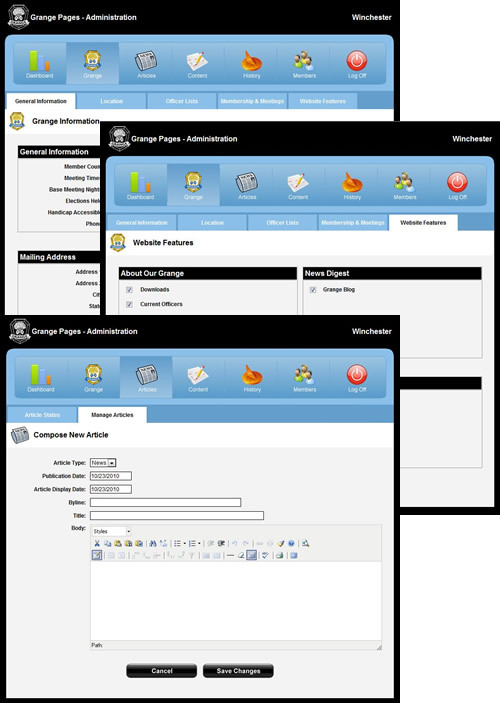 Granges will also have the ability to maintain member lists, track members’ addresses and e-mails, and send out mass mailings such as newsletters, event notices, and much more. Grange Website program can purchase a Website Package from the Connecticut State Grange for the cost of $45.00 per year. You don’t need to be a computer expert to use the system. The only tools needed are a computer, basic computer skills and access to the Internet. Training sessions are provided on website set up and usage. Troubleshooting and technical support are also available. 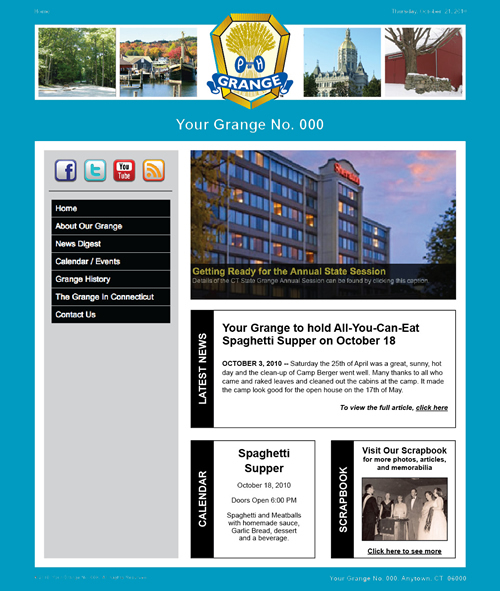 To get your Grange on the web, download the sign-up form here. For more information, contact information@ctstategrange.org.